Pin and wrench for H.28, H.28H and H.28SJ Handpieces. Use for changing collets and accessories. Wrench assembly for H.8, H.8D and H.8SJ Handpieces. Use for changing collets and accessories. Pin and chuck wrench for H.43T, H.44T, H.44TSJ, H.44HT, H.35, H.35SJ, H.25, and H.25H Handpieces. Use for changing collets and accessories. Complete Heavy Duty, Square Drive Assembly includes S-10823 Square Drive inner shaft (63-3/4″ long) and S-10801TX Heavy Duty outer sheath (63″ long) with SS10819 Silencer Spring. Offered here for replacement on Series SRH, TXH and LXH motors. Assembly comes pre-lubricated from factory. 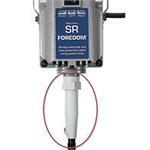 Square drive shafts can only be used with Foredom’s square drive handpieces. This foot operated speed control comes in a metal housing and the extra weight provides added stability and control. The bottom surface of the C. SCT is covered with non-skid material. It features the same durable, solid state electronics as the C.FCT. The ergonomics allow precise and reliable speed control with your foot. 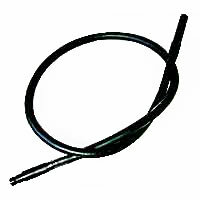 For use with 115 Volt M.SR, M.SRB, M.SRH and M.SRBH motors. CSA Listed. 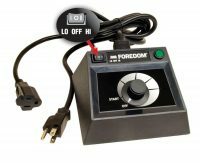 It is interchangeable with Foredom’s C.FCT-1 and C.EM-1 controls. 6-3/4″ long, 4″ wide, 2-3/8″ high, ship wt-6 lbs./2.7 kg.Can also be used with these discontinued motors- Series CC and DD, Series L and LB, Series F, Series PG and 1/8 Horsepower Series S, SB, SR and SRB motors. The C.SCT-1 can also used with a Dremel 732 flex shaft tool to vary speed. The .25 ounces of oil in this hypodermic dispenser is high grade machine oil. The dispenser has a 1″ long needle with a rubber stopper cap. To dispense, the unit must be squeezed – it is not gravity fed. For use with H.43T, H.44, H.44T, H.44TSJ, and H.44HT collet-style handpieces. 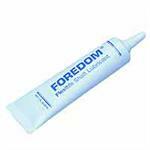 Foredom H.50 Chisel Handpiece Grease in a .5oz tube. The reliable C.FCT-1 is Foredom’s most popular foot operated speed control. It is made of heavy-duty plastic with durable solid state electronics. The ergonomics allow precise and reliable speed control with your foot. 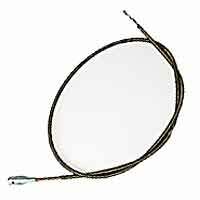 For use with 115 Volt M.SR, M.SRB, M.SRH and M.SRBH motors. CSA Listed. 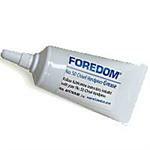 It is interchangeable with Foredom’s C.SCT-1 and C.EM-1 controls. 7″ long, 4-1/2″ wide, 2-3/8″ high, ship wt-2 lbs./1 kg.Can also be used with these discontinued motors- Series CC and DD, Series L and LB, Series F, Series PG and 1/8 Horsepower Series S, SB, SR and SRB motors.The C.FCT-1 can also used with a Dremel 732 flex shaft tool to vary speed. New Dual Speed Range table top speed control was designed for use with the reciprocating (not rotary) Foredom Filer. Set to ‘LO’, motor speed is restricted to between 1,000 – 10,000 RPM or 400 – 4,000 SPM – the Filer’s allowable speed range. Flipping the toggle switch to ‘HI’ permits use with rotary handpieces at regular motor speeds. This control is also ideal for use with the reciprocating H.50 and H.50C Chisel Handpieces that have low recommended operating speeds of 1,000 – 8,000 RPM. This table top speed control is constructed of heavy duty plastic with durable solid state electronics. It has a dial control for precise speed settings, as well as good repeatability of previous settings. 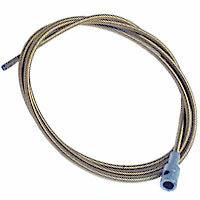 For use with 115 Volt M.SR, M.SRB, M.SRH and M.SRBH motors. Can also be used with these discontinued motors- Series CC and DD, Series L and LB, Series F, Series PG and 1/8 Horsepower Series S, SB, SR and SRB motors. The C.EM-1 can also used with a Dremel 731 flex shaft tool to vary speed. 5″ long, 5-3/4″ wide, 2-5/8″ high, ship wt-2 lbs./1 kg. It is interchangeable with Foredom’s C.FCT-1 and C.SCT-1 controls. This handy plastic brush is great for clearing off a workpiece and moving wood chips, metal and other accumulating debris through the vacuum port and into the hose of a dust collector. 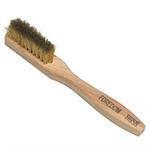 The top end of the brush has a slide that exposes 3/4″ long and 1/2″ diameter bristles. 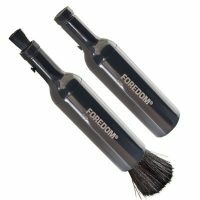 The bottom end has a twist action to expose and retract 1-5/8″ long x 1″ diameter bristles. 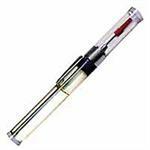 5-1/2″ long when closed. Table top speed control is constructed of heavy duty plastic with durable solid state electronics. It has a dial control for precise speed settings, as well as good repeatability of previous settings. C.EMX-1 has special electronics that converts AC current from an electrical outlet to DC current- the type required by the motor. 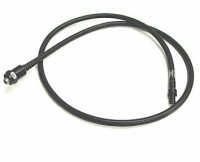 It also has a special plug that fits the motor’s shielded plug. 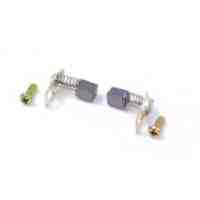 Chuck key for use with H.30, H.30H, H.30SJ and H.25C Handpieces. This 1/8″ thick rubber cushion provides an added layer of comfort to H.30 and H.30SJ Handpieces. Grip slides on easily bolt holds firmly. Micro chuck with 3/32″ shank allows the use of smaller shank accessories without having to change handpiece collet. 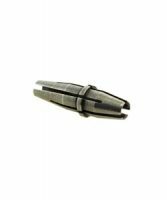 Ideal for use with 1/16″ shank friction grip burs in 3/32″ (2.35mm) collet handpieces. 3/32in (2.35mm) collet for H.44, H.44T, H.44TSJ, and H.44HT Handpieces. 1/8in (3.18mm) collet for H.44, H.44T, H.44TSJ, and H.44HT Handpieces. 1/4in (6.35mm) collet for H.44, H.44T, H.44TSJ, and H.44HT Handpieces.